Gadolinium-Based Contrast Agents (GBCA) are intravenous drugs used in diagnostic imaging procedures to enhance the quality of magnetic resonance imaging (MRI). The FDA currently considers GBCAs safe, however the development of nephrogenic systemic fibrosis (NSF) has been observed in patients with impaired renal function who are administered GBCAs. Recent research has emerged regarding the accumulation of gadolinium in tissues (bone and brain) of patients with normal renal function, with the retention of gadolinium increasing in patients who have repeated GBCA exposure. Despite these observations, very limited data regarding the form (e.g. species) of gadolinium accumulated and the mechanisms of accumulation and/or toxicity are known. Researchers and staff from the Medical University of South Carolina are collaborating with NIST staff experienced in trace elemental speciation, sample preparation and instrumental analysis in order to demonstrate the bioaccumulation of intact GBCA in patients who have repeated GBCA exposure. Patients with as few as four GBCA exposures are shown to have detectable levels of gadolinium. The use of laser ablation coupled to inductively-coupled mass spectrometry permits detection of this bio-accumulation in specific regions of the brain. Additional research to determine the mechanism for the gadolinium accumulation is ongoing. (A) Sagittal image through the level of the dentate nucleus prior to the last dose of gadolinium-based contrast agent (GBCA). No hyperintense signal is demonstrated within the dentate nucleus. (Note that the globus pallidus demonstrates T1 shortening due to hypoxic ischemic injury.) (B) Autopsy section through the cerebellum. (C) Laser ablation inductively coupled plasma mass spectroscopy (LA-ICP-MS) gadolinium distribution map corresponding to the autopsy section in (B) demonstrates heavy deposition of gadolinium within the dentate nucleus. In addition, there is gadolinium deposition throughout the cerebellar cortex, particularly within the depths of the cerebellar folia. (D) Autopsy section through the cerebellum of the control patient not exposed to GBCA administration. 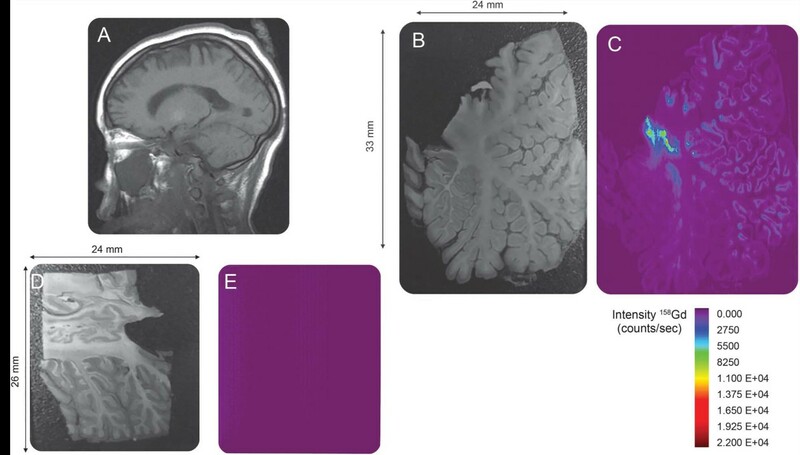 (E) LA-ICP-MS gadolinium distribution map corresponding to the autopsy section in (D). The structure of the cerebellum is not seen and the signal intensity is equal to background as no gadolinium is detected in the control specimen. Justin P. Bandino, Harriet B. Hinen, Robert M. Gathings, Marta T. Hampton, W. Clay Davis, Dirk M. Elston, “Gadolinium Presence Within Cutaneous Sclerotic Bodies Confirmed by Laser Ablation Inductively Coupled Plasma Mass Spectrometry,” JAMA Dermatology, 154 (1) 105-106, 2018.